Dawn Moreno, who debuted in G.I. Joe: A Real American Hero #226, was once a gifted high school athlete whose unique physical abilities drew the attention of Cobra Commander. The Cobra elite put Dawn under intense experimentation, accidentally implanting the memories of the original (and now deceased) Snake-Eyes into Dawn's fragile teenage mind. Now, as a haunted Dawn struggles against visions of a dark past that does not truly belong to her, Snake-Eyes' longtime ninja comrades from the Arashikage Clan have joined together to help Dawn overcome the waking nightmare her young life has become. Said Hama about Dawn and her introduction. "As I recently told our readers, Dawn Moreno is a fascinating character who provides me with a brand-new canvas to paint on. 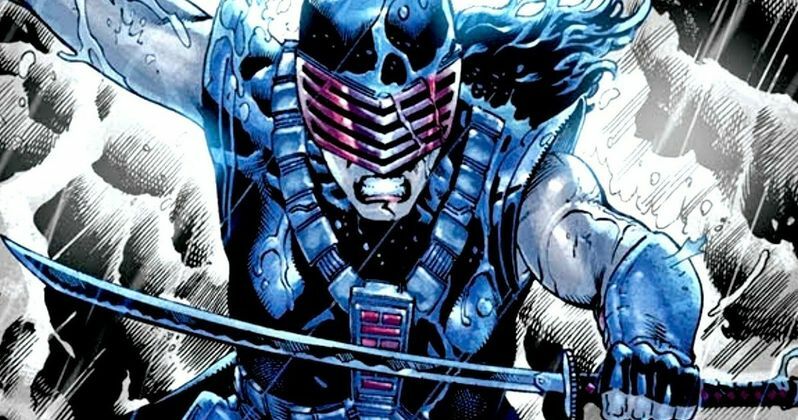 With the original Snake-Eyes' memories implanted into her young mind, Dawn gives me a whole new way of looking at character qualities (both her own and those of Snake-Eyes) that isn't bogged down by accumulated continuity with a new character, who can voice things that were always left unsaid." Issue #226 featuring Dawn's first appearance is sold out, but fans can jump on board with Volume 16, which collects that issue and marks the beginning of her journey to becoming Snake-Eyes. To meet demand, a second printing of issue #246 will be rushed to the printer, featuring the special Netho Diaz cover art seen below. It's possible with Paramount's G.I. Joe movie franchise stalled at the moment that Dawn could take center stage in the long-gestating G.I. Joe 3 opposite The Rock's Roadblock, who has long been confirmed to return. If the second printing of her debut comic sells out, that's entirely possible. Paramount wants to do a Millennial freindly reboot of the G.I. Joe movie franchise, and this may be the first step towards that. It's also possible that Dawn could get her own standalone G.I. Joe movie sometime in the future if fans continue to respond positively to her as a character. IDW Media Holdings, Inc. is a fully integrated media company, which includes publishing, games, entertainment, and the San Diego Comic Art Gallery. IDW Publishing's comic book and graphic novel catalog includes some of the world's most popular entertainment brands, including Transformers, My Little Pony, Star Trek, Teenage Mutant Ninja Turtles, Ghostbusters, and Disney's classic characters. At IDW's core is its commitment to creator-owned comics including 30 Days of Night, Locke & Key, Wormwood, Ragnarök, V-Wars, and Archangel by bestselling sci-fi author William Gibson. IDW Publishing is also home to the acclaimed and award-winning imprints; Top Shelf, The Library of American Comics, Yoe! Books, and Artist Editions, showcasing the greatest original art ever published in American comic books. IDW Games' diverse line-up includes the international phenomenon Machi Koro, as well as hit licensed games such as X-Files, Back to the Future, The Godfather, and TMNT. IDW Entertainment serves as the worldwide distributor of Wynonna Earp airing on the Syfy Channel in the U.S. and is producing BBC America's Dirk Gently, based on the bestseller by Douglas Adams starring Elijah Wood and Samuel Barnett.